The Hands of Almalexia are the personal guards of the goddess Almalexia. The Hands are pledged to honor, protect, and serve Almalexia in all ways. Also referred to as simply "Her Hands", their bodies and souls are fortified by divine magic, and their armor and weapons bear fearsome divine enchantments. Some say the Hands are the most terrible mortal warriors in the world. Despite their enchantments, they are actually 10 levels lower than the respawning High Ordinators patrolling the streets. (Salas Valor is an exception as he's level 40 rather than 50.) Their enchanted armor and weapons more than make up for this difference in level, however. In the past they used to spend much of their time punishing criminals and protecting the people. Now they spend all their time protecting Almalexia. The Hands are currently led by Almalexia's Chief Steward, Fedris Hler. Speaking to any of the Hands will have them express their undying loyalty towards Almalexia, after which they will send you on your way: "We await the Goddess' command. Her word is our law. There is no time to speak with the likes of you." If you are wearing the sacred cuirass and/or helmet, conversing with a Hand will have them stay their hand, unlike with other High Ordinators: "You wear the sacred garb of the Ordinator, but you are not of the Order. I stay my hand solely at the Lady's discretion. Speak with me no more." 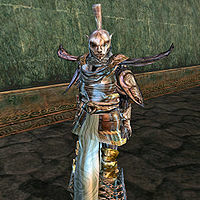 Like the rest of Morrowind, the Hands will not recognize Almalexia's demise, and continue to say "await the Goddess' command" and "at the Lady's discretion" if you have killed her.